The more a smart thermostat knows, the more useful it is. When it knows what you’re doing, it can make smarter decisions in real time, which translate into more energy savings that don’t impact your comfort at home. However, most thermostats don’t know a lot. Confined to one room, they have limited information about your activity. This makes it hard for them to adapt to your schedule and react to real-time activity triggers. Our Smart Thermostat is different. It’s wirelessly connected to all of the sensors and devices in your security system, so it understands what’s happening throughout your home. It even uses the weather and your location to save energy and maximize comfort. Here are five really useful things it knows. While standalone smart thermostats rely on a single, built-in motion sensor to guess if you’re home, ours knows definitively, thanks to the status of your security system. When you leave home and arm your system to ‘away’, it starts saving energy instantly. Disarm the system when you come home and our thermostat makes things comfortable again. Of course, it can take a while to get your house to the perfect temperature. Alarm.com’s Geo-Services anticipates your arrival, using your smartphone’s location, and triggers your thermostat to make things comfortable in advance. It’s easy to customize, which means that you can time it so the temperature is perfect right when you arrive. Running your AC with a window or door open is a big waste of energy. Thanks to your security system’s door and window contact sensors, Alarm.com’s Smart Thermostat knows instantly when you open a window or door, and can automatically cut back. An alert will let you know what’s happening and it’ll return your home to a comfortable temperature when you close it. Our thermostat knows what’s happening outside the house as well, using data from the National Weather Service to anticipate how hard it needs to work. On especially hot or cold days, it can dial back a few degrees to save energy without making you too uncomfortable. It’s also compatible with many utility companies’ demand response programs. You can save extra with discounts and incentives, while also helping your community on really hot days when electricity demand spikes and puts a heavy burden on your utility. 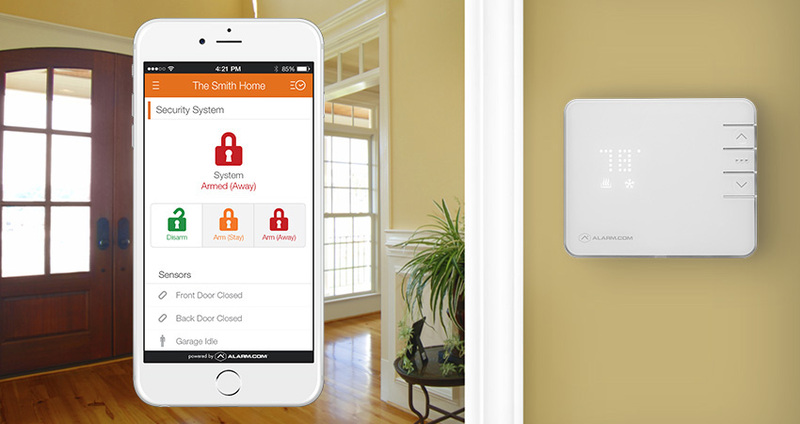 Because it’s connected to our Smart Home Security system, our thermostat even has fire and carbon monoxide safety features. In the event of your connected smoke / carbon monoxide sensor detecting either of these hazards, our thermostat instantly shuts the HVAC down, preventing toxic gases from circulating through your home.